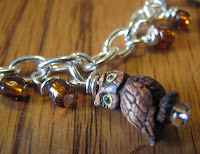 I love these tiny beads. They're ceramic, made in South America (I believe), and beautifully intricate. They're about 1/2 inch long, and look at the detail! 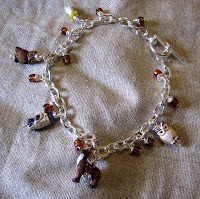 I recently used some to make up more bracelets for the Etsy shop. Charming, eh? 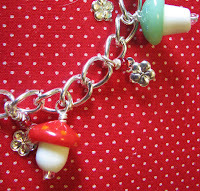 Another bracelet features little glass mushrooms. Too much cute? Maybe just enough cuteness....?